An aquarium filter that is well matched to your goldfish setup should save you work. With the large number of options available in today's market, you need to choose which option is best for you while keeping a wary eye on quality. Most assume the job of aquarium filters is to filter the aquarium water. That sounds reasonable, but if you buy your filter based on that assumption, you will buy the wrong filter. The primary job of a filter is to circulate water through a colony of beneficial bacteria that convert aquarium waste to harmless compounds. The secondary purpose of a filter is to provide a limited amount of filtering of solids from the water. This secondary function is very limited. As an example, a standard filter can't filter out suspended green algae because the algae are too small to get caught in the filter media, and the bacteria don't feed on the algae. As a general rule, a filter should circulate the aquarium water volume through itself twice an hour. In other words, a 100 gallon aquarium needs a filter that has a water flow of 200 gallons an hour. Most filters have a label stating their water flow per hour in liters or gallons. Be cautious of this figure because this water flow is based on a new installation with no clogging of the filter media. 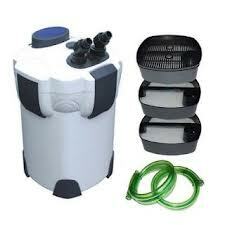 As bacteria colonize the filter, and solids get filtered out of the water, the water flow decreases. I tend to halve the quoted water flow figures when buying filters, as this is the usual loss of filtering efficiency once the filter is established. A filter that is the correct size for an aquarium shouldn't have to be cleaned out because of clogging more than 2-3 times a year. Undergravel filters are hard to estimate how much water is flowing if you aren't using powerheads. The rule for these types of filters is cover as much of the aquarium bottom as you can. Make sure the gravel is deep enough so that at least 1.5 inches (38mm) is left undisturbed by feeding goldfish. Generally, the smaller your setup is, the less options you have, or at least, the less filter media options you have. Smaller filters generally use sponge inserts, and have little or no room for additional media such as activated charcoal. For aquariums up to say 15 gallons (around 70 liters), you can use internal box filters, undergravel filters, external hanging filters or a small internal power filter. For larger setups, if the goldish aren't too large, undergravel filters are an option, but the ideal filter for larger setups is the external canister type shown above. These filters usually have three media trays that can have varying sizes of media in them, coarse at the top, fine at the bottom. On cheaper air lift type filters, check where the air line connects to the filter that it is robust enough for the job. There is nothing worse than setting up an aquarium with undergravel filters only to snap off the plastic tube that the air line fits on. If you have any doubts about quality, warm up the air line under a hot faucet. Some canister filters coming out of Asia are poorly finished, especially where the sealing "O" ring seats. I suggest testing the filter for a few days where it can do no damage if it leaks. The pump rotors on these filters can also show wear after only a few months use. Each filter has its good and bad points. Aquarium filter media - what makes your filter work.